Your dog looks so dapper! Just got the latest issue of Craft and saw your embroidery mention! Congrats! that's one patient dog! That stache is tooooo cute! So cute! I wonder what my little one would look like with a handle bar! That is the coolest thing I've seen all day. I love your dog! LOVE IT! Keep the awesome Dog photos coming, please!!! 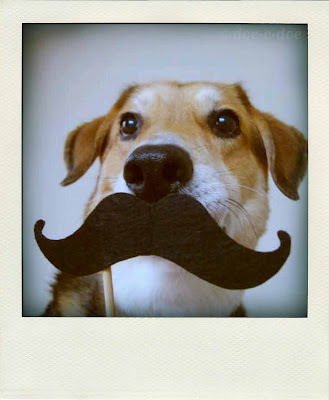 your dog must love you sooooooooooo much to let you dress him/her up in all that silliness! I know that one shouldn't want a dog simply so that one can dress said dog in amusing costumes . . . but dang! That is uber-cute!